Plated growth rates may have been underestimated this week due to a frost followed by a heavy dew and wet pastures when the farm walk was completed. These conditions result in the pasture compressing more during plate metering, reducing the measured height. The team noticed a bigger difference between the plate and visual estimates this week which we attribute to this. Estimated growth from visuals were in the 35-40 kg DM/day range. Cows are being returned to paddocks occasionally to ensure residuals are hit and paddocks are cleaned up appropriately. Due to the APC tracking above the feed wedge targets, no supplements will be fed this week. Residuals will be monitored through the week to see if baleage needs to be added to the Std. Kale farmlet, in particular the 48-hour grazed paddock. The final application of N (25 kg N/ha) will be applied to 70% of the Std. farmlets early next week with the remaining 30% receiving application before Easter. Soil temperatures must be above 7 °C and we will not apply N after mid-April (as outlined in our decision rules). Conserved paddocks were harvested this morning which included paddocks from LI kale (x1), Std FB (x2) and LI FB (x1). It was hoped to send away all Std. Kale cull cows, however, due to the waiting lists for the works the culls remain on farm. 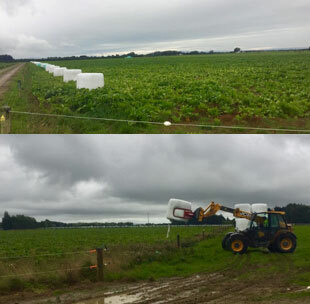 After feedback from the farmer reference group is was decided to place the baleage bales out into the crop before the start of winter grazing. This occurred using purchased bales this week. 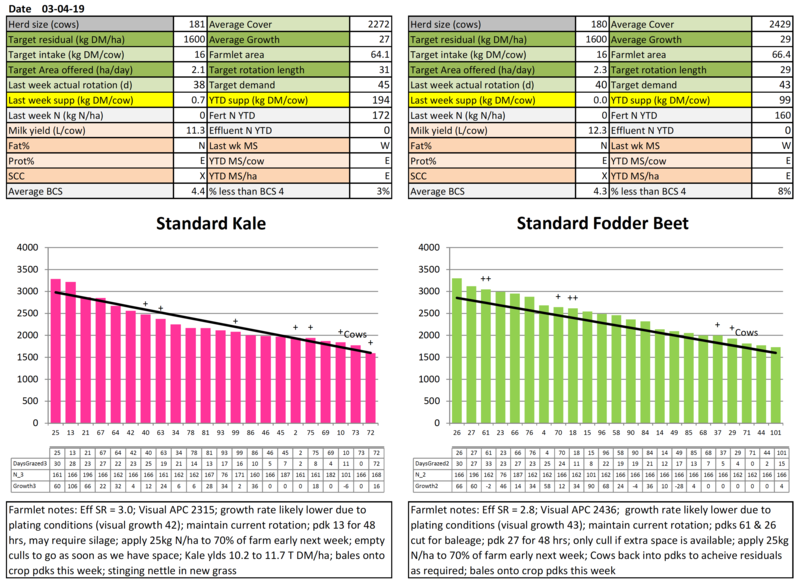 Confirmed kale crop yields have come through this week ranging between 8.7-12.8 t DM/ha. 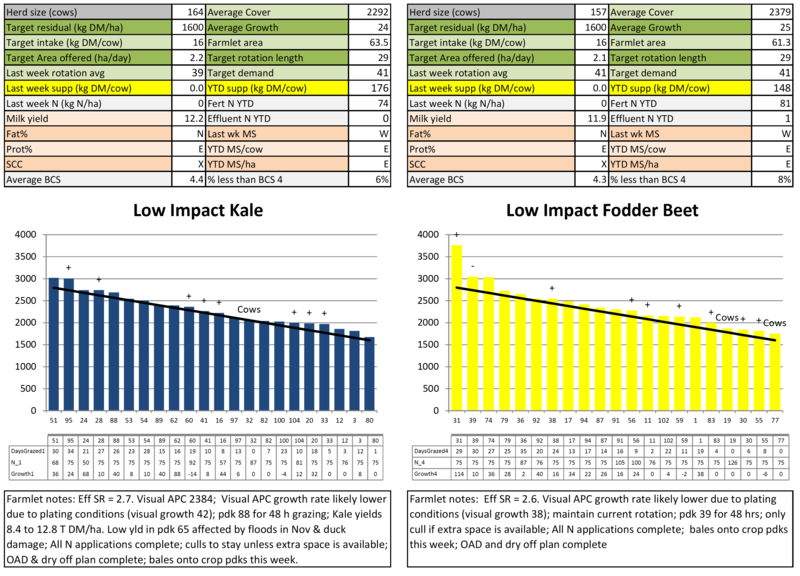 When doing our winter feed budget, the potential kale yield gain between now and winter will be added to the current yield measured so that accurate feed requirements can be calculated. The support block FB yields were also measured to be 18.6 and 20.8 t DM/ha. Stinging nettle has covered some parts of the new grass paddock quite thickly. Advice will be sought as to how to eradicate it without impacting the young grass. The process of putting the remaining cow collars started this week. This will enable more information to be collected and analysed for research. Cows were BCS this week. The average BCS was 4.3-4.4 across all farmlets with a higher % of Std FB and LI FB having less than BCS 4. Decisions regarding these lighter cows will need to be made soon so that cows can reach BCS targets before calving. Grazing has been found for the R2s. They will be run as x3 mobs and fed on pasture and baleage. Calves will be weighed next week and redrafted into their appropriate mobs. Soil samples have been collected from the potential 2020 crop paddocks. Results will be used to finalise the selection and commence the correction of any nutrient imbalances before establishment next spring. 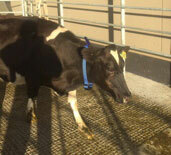 Lameness in the herd has become more prominent with the increased wet conditions. Some parts of the race close to the shed have become quite wet and small stones have been the main contributor to the lameness. The staff will be signed up to a healthy hoof course with the vets and a contractor will scrap the tracks close to the shed before the end of the season. Vet came out and did x2 liver biopsies on cows from each farmlet. This information will be used to determine mineral supplementation for the herds prior to and during winter. Next week the vet will be doing the Hub’s dry cow consult. The research team are busy preparing for our end of season and pre winter measurements on the R1’s and R2’s on top of the ongoing activities in the farm systems comparison.